Representatives from Chevrolet and the Indianapolis Motor Speedway announced today that the all-new 2003 Chevy SSR will serve as the Official Pace Vehicle for the 87th running of the Indianapolis 500 on May 25. "As we continue to build upon Chevrolet's strong performance heritage, we couldn't imagine a more appropriate venue for us to showcase our new SSR as we near the start of regular production," said Janet Eckhoff, marketing director for SSR and Chevy's mid-size trucks. "This will certainly be another great milestone for the Chevrolet and Indianapolis Motor Speedway record books." This marks the 14th time a Chevrolet product has served as the official pace vehicle - the most appearances by any brand since the first use of a pacemaker in 1911 - and the first time a truck-based Chevrolet will lead the charge to the green flag. Chevrolet and the Indianapolis Motor Speedway have often been linked together as powerful symbols that stir the imagination of automotive enthusiasts around the world. "We're pleased that the Indianapolis Motor Speedway and Chevrolet are continuing this long-time relationship," said Tony George, president and CEO of the Indianapolis Motor Speedway. "Having the new Chevy SSR leading the field to the green flag on May 25 will certainly contribute to a memorable Indianapolis 500." This year's edition of the Memorial Day classic will find Chevrolet out to repeat its recent on-track winning performance. The "Bowtie" returned to open-wheel competition in 2002, capturing 14 of 15 IRL events, including the Indy 500, and the series championship. In all, Chevy has won 100 Indy-style races, including seven Indianapolis 500 victories, and six series titles since 1986. "Everyone at Chevrolet is proud to be associated with the Indy Racing Series and the Indy 500," said Brent Dewar, the recently-appointed general manager of General Motors' largest division. "The SSR is the latest in a series of SS-branded Chevy cars and trucks that will rekindle the fun-to-drive heritage of the Super Sport name. In keeping with our long-term goals, they will be vehicles many people will aspire to own and also be able to afford." 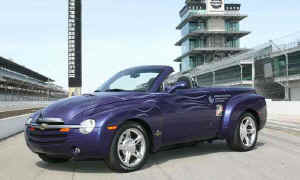 The Chevy SSR that will serve as the Indy 500 Pace Vehicle is virtually identical to the 25 unique 'Signature Series' saleable units to be built before regular retail production and shipment to Chevrolet dealers begins this summer. The Signature Series vehicles will be used to create one-of-a-kind "pedigrees" for each vehicle before they are offered for sale through public or GM dealer auctions during 2003. "The SSR (standing for 'Super Sport Roadster') is like nothing else in the market today. It's part roadster, part pickup and is a completely innovative expression of Chevy's proud heritage," said Eckhoff. A highlight of SSR's design is a unique one-button power-operated retractable hardtop that stores vertically and out-of-sight between the passenger and rear stowage compartments. The frame and chassis of the SSR are similar in design to Chevy's mid-size TrailBlazer family of sport utilities. All major exterior panels are of one-piece stamped steel. Under the hood is a new aluminum-block version of GM's Vortec 5300 (5.3-liter) small-block V8 that develops 290 horsepower at 5200 rpm and 325 lb-ft of torque at 4000 rpm. That power drives the rear wheels through a four-speed automatic transmission. Rounding out SSR's sporty street machine appearance are 19-inch front and 20-inch rear tires and wheels. The primary pace vehicle emulates the appearance and content of a Signature Series model. When the checkered flag falls, it will be placed on display in the Indianapolis Motor Speedway Hall of Fame Museum. The back-up pace vehicle is VIN #4 of the saleable Signature Series model run, carrying the signatures of John Middlebrook, GM Vice President for Vehicle Sales & Marketing, and Mark Reuss, Executive Director of Operations for GM Engineering & Special Vehicles. After the race it will continue to be used in various pedigree-building activities then, like nearly all other Signature Series units, will ultimately be offered for sale through auction. A third SSR that emulates the appearance and content of a Signature Series model will be on display during the month of May for up-close viewing by visitors to Indy's Hall of Fame Museum. After the May race it will be a welcome addition to GM's historic collection in Detroit. Few modifications were made to the three vehicles to prepare them for pacing the 33-car field on the 2.5-mile oval. Exteriors receive a subtle silver ghost-flame paint scheme across the hood, front fenders and doors, a safety strobe light bar recessed into the tailgate, polished stock cast aluminum wheels and race event graphics. Inside, racing-type safety belts have been added. Inclusion of heavy-duty engine and transmission oil coolers, higher rate springs and shocks, and a lower restriction exhaust system provide further assurance of optimum performance in the harsh environment of professional racing.